A few years ago, my friend was working for a telescope company. He brought back a 1200mm telescope. Using a T-mount adapter, we were able to mount it onto my Canon EOS SLR camera body. We were able to shoot some really nice pictures of the moon and see some craters. We got even closer by mounting both of my 1.4x and 2x teleconverters. (See my article on "Stacking Teleconverters".) The view was spectacular; we were able to fill the entire 35mm film frame with half of the moon's face. Every single crater showed up clearly, whether large or small. We clicked the shutter release to capture this grand exhibition and, behold, the battery symbol continuously flashed on the LCD while the camera went into an error state. 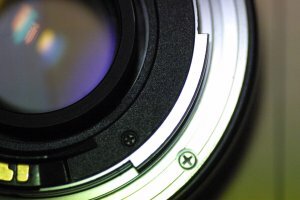 After experimenting with the camera, teleconverters, and lenses, I realized that the auto teleconverters must be used with auto lenses. Auto teleconverters with pass-through contacts cannot be used with manual lenses, such as my friend's telescope. As much as I like camera equipment, I did not want to spend more money on manual teleconveters. Plus, I don't even think manual teleconverters are available for Canon EOS cameras. Luckily, for me, I had discovered how the Canon EOS cameras determine whether an auto or a manual lens is mounted. The camera monitors a switch on the lens mount. Each lens has a tab for mounting. On auto lenses, the tab is longer, thus triggering the switch. The tab is shorter on manual lens and will not trigger this switch. 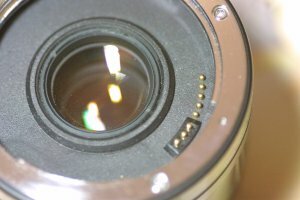 In order to use auto teleconverters with manual lenses, mount the manual lens to the teleconverter as normal. 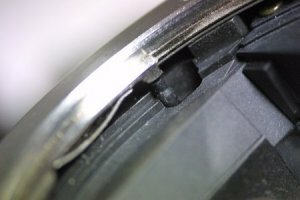 But when mounting the teleconverter to the camera body, do not turn the teleconverter all the way to lock position. When done correctly, the switch will not be triggered and the camera will operate as if a manual lens is mounted. 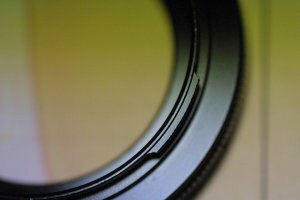 The tab on an auto lens is longer. 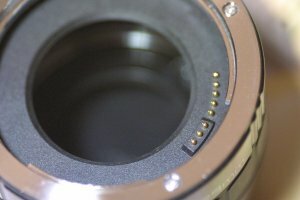 The tab on a manual lens is shorter. Using this method, my friend and I were able to shoot wonderful close-up pictures of the moon that night. This same method works with auto extension tubes also. Realize that when using the equipment in this manner, the camera and teleconverter/lens are not locked to one another. Rotation to either could cause them to detach from each other. If you choose to use equipment in this manner, be very careful. I will not be responsible for your actions. Using manual lenses and telescopes with EOS cameras. Copyright © 2003 by Chieh Cheng. All Rights Reserved.